Google docs is not your standard cloud-based word processor. Beneath the simple presentation lies a bag full of tricks and features which can fulfill almost all your needs. You might take time getting used to the different tools available and implementing them but that’s part of the process. Besides being free software and being part of the Google Family, Google Docs is slowly but steadily becoming the first choice Word Processor. Personally, I have never experienced a complaint or issue after years of using the software. In this article, we will be looking at the factors which made Google docs incredibly popular and also, we will be showing you an easy way on how to double space in Google docs. After discussing google docs double space, we’ve provided some awesome features of Google docs that you may don’t know as you weren’t aware of Google search secrets earlier. Instead of adding space manually between each line, you can have double space within a click. As Google docs is accessible on both desktop and app, we will be exploring Google docs double space trick for both. Step 1: Firstly, open the required document at http://docs.google.com. Step 2: Now you need to highlight the portion of the document you need to double space. By choosing the edit option in the menu bar and clicking select all you can highlight the entire document. Step 3: In the menu bar select the format option. Step 4: A drop-down window appears, choose the Line-Spacing Option. Otherwise, you can also select Line-Spacing from the toolbar. Step 5: Select the double option from the formats available. You will find Now the highlighted portion will be double spaced. 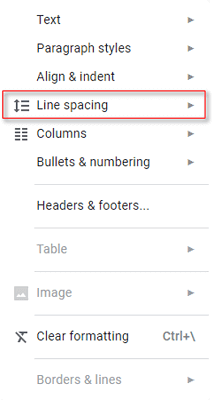 Let’s check how to double space in Google docs mobile app. The method of adding double space in Google docs Android, iOS app is almost the same. Follow these steps and you’re good to go. Step 1: Open Google docs app and select the document which you need to modify. Step 2: Choose the edit option in the lower right corner of the screen. Step 3: Now you should highlight the text you want to double space. By tapping on the text you can choose Select-All to highlight the entire document. Step 4: Choose the editing Menu which is basically an A with horizontal lines in the top-right corner. Step 5: Now select the Paragraph Tab from the Top of the menu. Step 6: Nextly set the Line Spacing Option to 2.00. Now click anywhere on the document and the highlighted portion is edited. Adding double space on Google docs app should become easier by now. Google Docs allows you to store different types of files including the audio file, pictures, spreadsheets, presentations, documents, etc. Additional files can be opened using the add-ons. One of the coolest features about Google docs is that you can create your own personal words and add them to the personal dictionary. For example, you might be playing a video game and come across a cool new term or phrase which is not there in conventional English. Luckily, using Google Docs, you can add them to the person dictionary thereby convincing it that it is an existing word. The revision history feature in Google docs allows people to see the history of changes made in a particular document. Sometimes many ideas which should have been included in the document might get removed. Using this feature we can restore the deleted content if needed. One of the most powerful features of Google docs is that people from all over the world can work on the same project in real time. During the collaboration, the document owner can restrict the control of others over the document. He can make it a view only or can let them edit the document. Google docs recognize 53 languages and you can choose any one of them. This lets you translate your documents to any language you prefer. Google Docs let you know whenever you have mistyped a word and you can accordingly correct it. Also, it can detect whenever you add a link to a spreadsheet. It has a feature by which it converts plain text into a link. With one click you can move into the corresponding link. By forging a partnership with third-party software, Google has brought forward a host of third-party Add-ons for use in Google Docs. You can find the list of add-ons by selecting get add-ons from the add-ons tab. A few of the popular add-ons available include Thesaurus, UberConference, OpenClipart, etc. Compare to other word processors, the offline feature in Google Docs is pretty solid. When your WiFi shuts down, it automatics switches to the offline mode and you can create new documents. When you are back online all the changes will be synchronized. 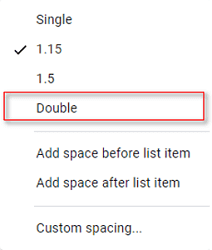 In this article, we have provided you information on how to double space in Google docs. We have also explained the features which made it so popular in the first place. If you have any queries regarding the article, feel free to solve it by putting them in the comment section below.